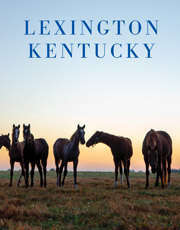 Whether arriving by air or by highway, getting to Lexington is easy, and so is getting around. Lexington&apos;s Blue Grass Airport, a 10-minute drive from downtown, is located near Keeneland Race Course and surrounded by horse farms -- creating one of America&apos;s most beautiful air approaches. In the downtown area, many attractions, restaurants and shops are within walking distance of major hotels. All the buildings surrounding Triangle Park in the heart of downtown are connected by pedways. An intra-city bus system (Lextran: 859-253-4636 or www.lextran.com) and taxis, Uber and Lyft provide convenient transportation options. There is a Greyhound Bus station on the north side of town (859-299-8804 or 800-231-2222). Miller Transportation offers inexpensive shuttle service between Lexington and Louisville. A tour by van is a great way to see horse country. Check out the Park, Sleep and Fly Promotion here. See information about direct flights.